Its been almost six months and it already seems so long to not have seen that guy called ‘Gary Neville’ on the pitch for Man Utd. Veteran of over six hundred appearances for Manchester United and over 80 caps for his national side England, senior Neviller not being around Man Utd after all these years leaves around bit of a wrench in the heart, it was always going to, just that a sense realization finally seems to be flowing through about what had long been a painful thought of his departure has transposed to actuality. The chants about him(remember them?) havent been heard for a while, it pains but they might not be heard again. Neville Neville, Is the name of your dad! To the Manchester United fans, he will always be fighter that he was on the pitch battling for the colours of his club, he was afterall a fan who made it onto the pitch. He was what a run of the mill United fan would stand for, passion for the club and nothing but hate for that team from Merseyside, the Anfield Kop and the noisy neighbours from Eastlands, long bereaved of major silverware. Its not as if his exuberance or over-enthusiasm as you might call it hasnt got it him into trouble, but that was the fan in him to go with the legendary player that he was, victory tasted sweeter if it had been rubbed into the rivals- players and fans alike. What they thought of him or still do is immaterial, he still doesnt give two hoots to them, while most rival fans still get riled up by him which is like a cherry on top of the cake for him, for there is nothing better for the United fan in him to cause a sense of vexation among them. Neville won 8 Premier League titles, 3 FA Cups, 2 League Cups, and 1 European Champions League title(didnt appear in 2008 truimph) with United. Other than these, he was selected in 5 PFA teams of the year and selected in the Premier League team of the decade(1992/93 to 2001/02). Say and think whatever you might wish to, what he achieved as a player on the pitch is a mightly impressive tally of medals. Whilst some of his teammates of yesteryears might have become more popular or earned more bucks, Neville truly carved a place for himself into United’s rather fabled history books and his passion, bravery, consistency and leadership to go along with his qualities with the ball at his feet, earned him the right to be a hero to the Stretford End faithful, and to the people he’s a hero who is one of their own, not just a player but a fan who came from within and played his heart out for the club. His career was long and filled with moments where he didnt mind showing up his distaste for anything not-Man Utd(and England) in the world of football. In March 2007, when Man Utd played Liverpool at Anfield. John O’Shea popped up to score a 90th minute winner in front of the Kop. After the game, he told reporters, “the 90th minute, in front of the Kop, Gary Neville just told me that was his dream.” For all the trophies and medals, that were earned by Gary Neville, football for him was still about the rivalries he grew up with. You name the world’s greatest footballing arenas and he played at a lot of them, but his dream was to put one over the rivals down the road. Red Nev wasnt just a fantastic rightback, arguably the best England has ever produced, but it was the sense of passion and aggression about him that made a difference, he wasnt afraid to bring the opponent down and see cards if it benefits the team and he wasnt afraid take mighty blows and put his body on the line to protect the colours that he wore on the pitch- United and England alike. He was a team man, he stood for his teammates and his mates stood for him. Not to forget that famous incident in the Highbury tunnel, Vieira laughing in the face of Neviller’s exuberance, only to see the captain Keano stepping in to knock sense into Vieira, what followed in the game was like a humble pie for Vieira as United thrashed Arsenal 4-2. That was the kind of camaraderie that he had with his mates and about rivals, pointless to say how much they hate him. Years down the line, Neville’s career reviews would contain classic matches. While his mates of yesteryears- Roy Keane will always be remembered for those battling 90 minutes in Turin, David Beckham for his setpiece wonders and the poster boy images, Paul Scholes for his dazzling passes and volleys, Ryan Giggs for a catalogue of mesmerising runs and artistic crosses, what Red Nev will be remembered for would transcend the boundaries of the the pitch- a warrior on it and a die-hard fan off it. Who is to forget how he refused to shake Schmeichel’s hand before the Manchester derby in ‘02 or the way he ran the length of the pitch at Old Trafford to rub it into the Scouse fans after their defeat in ‘06, and even more famously the incident involving him and the Judas- Carlos Tevez. Today, even as United are still looking to add to their array of widemen and to develop the Da Silva twins into lasting fullbacks, the memories of Red Nev and his best mate David Beckham marauding down the right side of Old Trafford are still rather fresh, for anyone to come match these two is going to be a hard ask, let alone better them. Even as Red Nev now prepares himself for punditry duties with ‘Sky Sports’, the fan in him is still there. And if ever there was to be an ambassador for the club who would travel around the world and spread the word of Manchester United, it should be Gary Neville, the fan who made it. 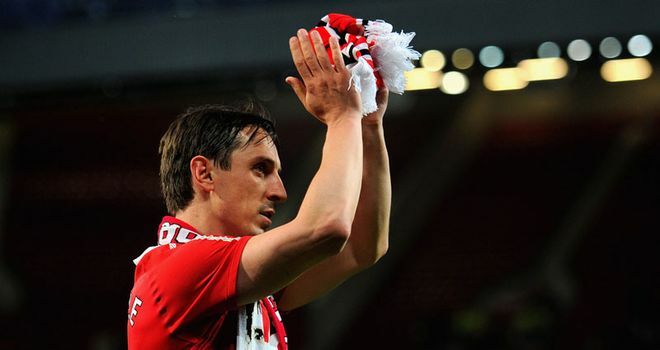 Gary Neville is a red, is a red, is a red,Gary Neville is a red, he hates scousers!